Red peppers are broiled with red snapper fillets until softened and then puréed with broth and onions to make a flavourful sauce for the fish. Place fish and peppers in foil-lined 15x10x1-inch baking pan. Brush with 2 Tbsp. dressing. Broil 5 min. on each side or until fish flakes easily with fork and peppers are softened, brushing occasionally with remaining dressing. Cover fish to keep warm. Cut peppers into chunks. Blend chicken broth, onions and pepper chunks in blender until puréed. Pour into saucepan. Bring to boil on medium-high heat, stirring frequently. Simmer on low heat 5 min., stirring occasionally. Remove from heat. Add cream cheese product; stir until blended. 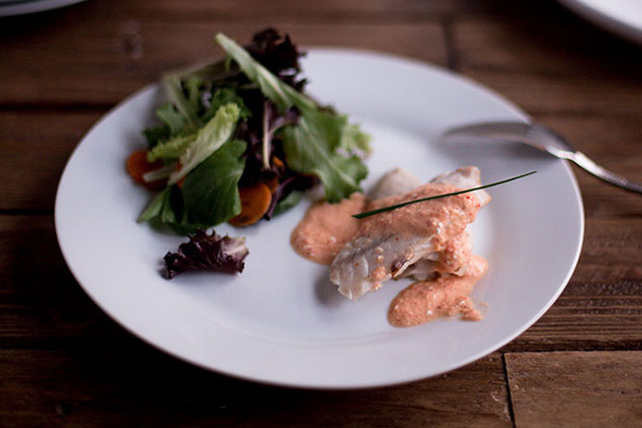 Serve fish topped with red pepper sauce. Sprinkle with 2 Tbsp. chopped fresh cilantro. When purchasing frozen fish or shellfish, make sure it is well-wrapped and solidly frozen, with no odor. Always check the "sell-by" date on the package. Never refreeze fish or shellfish once it's been thawed. Store it in the refrigerator, tightly wrapped, or in an airtight container, for up to 2 days. Look for fresh fish fillets and steaks with a firm texture, moist appearance and fresh odor (they should not smell fishy). Whole fish should have bright clear eyes. Store in the coldest part of the refrigerator up to 2 days.